Der Flächenschnitt ist eine neue Variante des Holzschnitts, welcher sich im Zuge der Erneuerung durch Munch und Gauguin herausgebildet hat: Flächen werden optisch aufgebrochen, Linien treten in den Hintergrund. Wie gelingt die Umsetzung von einer linearen Skizze zu einem lockeren, malerischen Holzschnitt? In dem 3 tägigen Workshop in der Kunstfabrik Hannover setzten wir uns mit dieser Technik und Umsetzung auseinander. Anmeldungen bitte hier. Die Holzschnittkünstlerin Christina Cohen-Cossen stellt Ihnen die faszinierende Welt des verlorenen Druckstocks vor und zeigt erste Schritte in den Einstieg dieser besondere Technik. Zum Thema „Im Netzwerk der Freundschaft ist das Glück ansteckend“ entsteht ein Farbholzschnitt mit wasserlöslichen Druckfarben. Durch das wechselnde Drucken und Schneiden erfahren wir, welche Möglichkeiten der verlorene Druckstock bietet und was dabei zu beachten ist. Christina Cohen-Cossen ist Autorin des Grundlagenwerks „Holz- und Linolschnitt“ aus dem Haupt Verlag. Die Teilnahmegebühr beträgt € 60,00. Materialien bitte mitbringen oder vor Ort kaufen. Er erscheint im 13. Jahr und wirklich ist Literatur im Kalender – Zitate, Textauszüge, Gedichte, Bilderbuchauszüge - Inspiration für Jedermann! Und alles dreht sich um des Menschen besten Freund. Auf dem Titelbild waren illustre Hundefreunde wie Robert Gernhardt, Elfriede Jelinek, Loriot (Vicco von Bülow), Martin Walser, Cornelia Funke, und Ernst Kahl. Für 2018 ist Juli Zeh mit Hündin Olga auf dem Cover zu entdecken. Erwin Grosche sieht man im Kalender mit seinem Zausel „Milik“ (Foto: Linsensüppchen 54), sowie im Text von Christina Cohen-Cossen im Holzschntt illustriert. 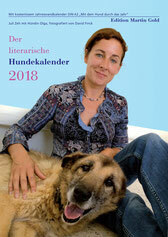 Ein wunderschöner Kalender für Hundefreunde und Literaturliebhaber. "Im Netz der Freundschaft ist das Glück ansteckend"
Freundschaftsnetz mehrfarbig mit wasserlöslichen Druckfarben. die wir bisher gezeigt haben. Wir freuen uns über dieses bunte Spektrum und über viele Geburtstagsgäste. Zur Eröffnung der Ausstellung am Dienstag, den 11. Oktober 2016 möchten wir sie und ihre Freunde ab 19.00 Uhr herzlich einladen. Die Künstlerin Christina Cohen-Cossen hat die Schüler/innen des Grundkurses Kunst S3 unter der Leitung von Heidrun Kremser ein Semester lang begleitet und sie mit der Technik des Holzschnitts vertraut gemacht. Wie freuen uns , die Ergebnisse dieses Projekts zusammen mit Arbeiten von Christina Cohen-Cossen zeigen zu können. Zur Ausstellungseröffnung am Dienstag, dem 9.2.2016 um 19.00 Uhr laden wir Sie und Ihre Freunde herzlich ein. Das Projekt fand im Rahmen der initiative "Unsere Schulen" statt und wurde von der Claussen Simon Stiftung gefördert. Woodcut cutting workshop. Pioneers of the modern western woodcut: stylistic attemp. The lost relief plate technique is approached on a theoretical basis using example works, and expolored practically on inidividually chosen motifs. "A compilation of the author Grosche's favourite pieces from over 40 years of stage performances. A poet among todays cabaret artists,his wide-open eyes seem constantly astonished by the world. "Entschleunigung"("deceleration") is entered into their spell check program,the computer promptly slows down. The tex ist not the only engaging feature of the book; readers may find their thoughts dwelling on the surreal illustrations by Christina Cohen-Cossen. A moocher is depicted to quite literally keep people on the hook, and a woman is transformed into a contrabass. The black-and-white illustrations lend additional colour to Grosche's world." "Guenter is called Walter in Winter". Graphical illustrations of Grosche's favourite texts by Christina Cohen-Cossen. Humour is rendered visible, cabaret displayed. The wit in a selection of Erwin Grosches pieces takes an artistic form through Christina Cohen-Cossens illustrations. The master carpenter and learned illustrator presents the result of her intensive study of Grosches work, which has enthralled her and inspired some independent ideas for paintings. Other than her wood and linocuts, there are black-and-white drawings and digitally developed images that, besides embellishing Grosche's narratives, have their own stories." "The cabaret artist from Paderborn celebrates 40 years on stage. Finally, he has succeeded in collecting all his texts, to charm and entertain readers as theylearn why Guenter ist called Walter in winter or what hte Paderborn palaver market is." Award for "Master of Arts" at Alma Hoppe's Lustspielhaus! Collaborative Exhibition on the occasion of the 40 year anniversary of Erwin Grosche's stage performances. Just in time for the start of the new season at Alma Hoppe's Lustspielhaus, Christina Cohen-Cossen presents new illustrations in the auditorium. The pieces were created to commemorate the 40th anniversary of Erwin Grosche's stage performances. An additional exhibition celebrating this occasion will take place in November in the Kulturguthaus (cultural heritage house) Nottbeck, Oelde/Westfalen. Newly released by the Belgian publisher, esperluete & éditions. A short story by Swiss author an journalist Annemarie Schwarzenbach, translation by Dominique Laure Miermont and Nicole Le Bris, illustration by Christina Cohen-Cossen. "Deux jeunes gens marchent le long du fleuve au fil des jours, bercés par une Nature tranquille. Ils font des rencontres : la louve, l'âne, la renarde, les bateliers, les montagnes bleues, comme autant de symboles du monde vivant. Un voyage onirique, hors de l'espace et du temps, qui suit son propre rythme." On the occasion of the "Altonale", the "Schaukelstuhl" (Ottenser Hauptstr.39a) presents a selection of prints created by the students on Christina Cohen-Cossen's woodcut course. Original proofs are offered for sale published in a limited edition. Presentation at the Trier University of Applied Sciences on the topic of book design and illustration in the context of modern media. Perspectives on suitability of different forms of teaching in the future are given, considering increased globalisation and digitalisation. Wood cutting workshop on 13.4.2013, 11 am-3pm. The lost relief plate technique is approached on a theoretical basis using example works, and expolored practically on inidividually chosen motifs. Pictures and paintings by Christina Cohen-Cossen, Igor Kuprin, Jonas Lauströer, Martin Burgdorff, David Hohmann, Annika Siems and host illustrator Prof. Anke Feuchtenberger are exibited. The book on wood an linocuts of the 2012 summer catalogue is introduced at the Manufactum branch in Cologne on 21./22.09.2012. Refinements of the printing process allowed for by new Manufactum press are demonstrated. Woodcut workshop on 15.9.2012, 10.30-15.30. "Form a line to an area". Creative techniques to help guide the development from a sketch to a complete piece are explored and explained. Woodcut workshop on 8.9.2012, 10.30-15.30. "Form a line to an area". Creative techniques to help guide the development from a sketch to a complete piece are explored and explained. MANUFACTUM I WALTROP I 2012-8-2./3. The book on wood an linocuts of the 2012 summer catalogue is introduced in the "alte Zeche" (old mine) in Waltrop during the Sports and Games days held by Manufactum. Refinements of the printing process allowed for by new Manufactum press are demonstrated. Pictures and graphics by Christina Cohen-Cossen are displayed in the newly opened restaurant "Lokal 1" in the Hamburger district "Schanzenviertel" until the end of the year. Opening hours are Tuesday to Saturday 11.00-14.30 and 17.00-23.00. Christmas exhibition on the 18.11.2011, 19.00-22.00 at the studio "Igor and the others", Ottenser Haupstr.39a,2nd floor. Prints, posters, books and post cards are offered for sale and works in progress are exhibited. Host illustrators Professor Bernd Mölck-Tassel an Vitali Konstantinov present their work. Lectureship at the Hamburg University of Applied Sciences, Design Department, for seminar series on Japanese woodcuts. Summer exhibition on the 29.4.2011, 19.00-22.00 at the studio "Igor and others", Ottenser Haupstr.39a,2nd floor. Prints, posters, books and post cards are offered for sale and works in progress are exhibited. Host illustrators Einar Turkowski, Hans Devolder, and Larissa Bertonasco present their work. Christina Cohen-Cossen presents tables made from drift wood found in the Elbe river at the "Gaarnhuus", Ottenser Hauptstrasse 26. Opening hours: Monday-Friday. 11.00-19.00, Saturday 11.00-18.00. The techniques of wood and linocuts are presented at the booth at the Altona Museum's Christmas fair. Leporellos and post cards are offered for sale. On the occasion of the Altonale, Jonas Lauströer presents his work at Paola Feinkost (Ottenser Hauptstrasse 59), and Christina Cohen-Cossen's work is displayes at mascha clothing (Ottenser Hauptstrasse 32). Summer exhibition at the studio "Igor and others", Ottenser Haupstr.39a,2nd floor. Prints, posters, books and post cards are offered for sale and works in progress are exhibited. Host illustrator Henriette Sauvant presents her work. Ottenser Haupstr.39a,2nd floor. Prints, posters, books and post cards are offered for sale and works in progress are exhibited. Among other Alumni studens of the Hamburg University of Applied Sciences illustration course, "Igor and the others" present their work on the occasion of the "Night of Knowledge". Books and paintings are exhibited at the Armgartstrasse 24, and a presentation on printing press graphics is given. Observe the author introducing the secrets of wood an linocuts on Saturday, 17.10.2009, starting at 10.30, at the booth of the publisher "Haupt Verlag". On the occasion of Boesner's birthday, production of relief plates and graphic printing are showed and explained. The presentation takes place at the Boesner Filiale Volkspark on Friday, 24.9., 14.00-19.00, as well as Saturday, 25.09. 10.00-16.00 at Glinde. The new book on wood and linocuts ist released in September 2009, published by Haupt Verlag. The history of woodcutting and the associated techniques as well as various projects are explained on the book's 152 pages. It is also available as limited edition of 200 copies, embossed with glossy cover and inlaid with signed original print. The limited edition is exclusivly abailable for purchase from Haupt Verlag, or directly from the author. Advent and Nikolaus Celebration on 06.12.2008, 14.00-18.00. Ottenser Haupstr.39a,2nd floor. Prints, posters, books and post cards are offered for sale and works in progress are exhibited.